KM Human Factors Engineering’s light treatment system is designed to improve the quality of sleep for offshore night-shift workers, Koos Meijer, a Human Factors Consultant with KM Human Factors Engineering, said at the 2016 IADC Human Factors Conference in Galveston, Texas. The reduced concentration, slower reaction time and impaired decision making that result from insufficient sleep can have serious repercussions for process safety, Koos Meijer, a Human Factors Consultant with KM Human Factors Engineering, said at the 2016 IADC Human Factors Conference in Galveston, Texas. Because the brain produces hormones to make us feel alert or tired based on light, night-shift workers – who can be found on every working drilling rig – are particularly vulnerable to poor-quality sleep. “Our body finds it hard to completely adapt to night work schedules because of these inconsistent light cues,” Mr Meijer said in his presentation on 4 October. KM Human Factors Engineering took its cue from NASA, which implemented a light treatment system for its own night-shift workers, and applied it to the offshore oil and gas industry. According to a survey conducted by KM Human Factors, one-third of workers reported getting poor-quality sleep while working night shifts. “They sleep very little, the quality of sleep is low, and they do not start the shift rested,” Mr Meijer said. Sleep deprivation has a negative impact on the prefrontal cortex of the brain, which is responsible for concentration, problem solving, memory and communication. In addition, since our brains convert short-term memory into long-term memory as we sleep, poor sleep leads to poor retention. “If we are sleep-deprived, we are not capable of learning that easily,” he said. Artificial light offshore rarely exceeds 500 lux, Mr Meijer said, while daylight, even on a cloudy day, typically surpasses 2,000 lux. Therefore, when night-shift workers are exposed to very little blue light during their shift, the brain wants to produce melatonin. The reverse is true at night – when a worker is exposed to lots of blue light before trying to go to sleep, they have trouble falling asleep. 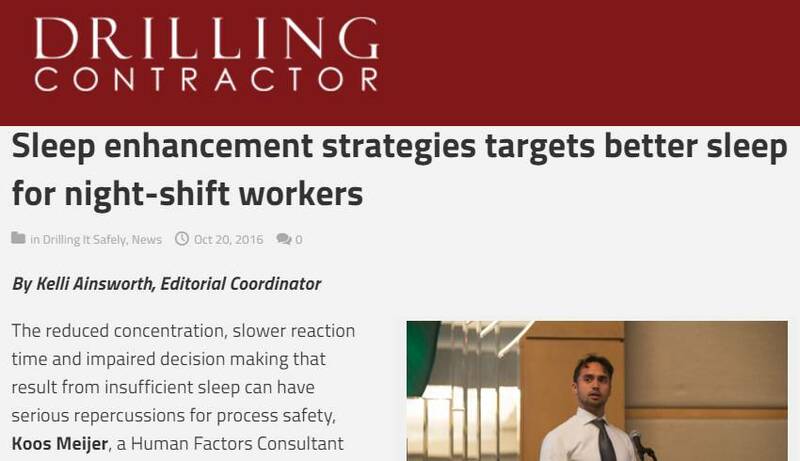 In order to try and correct circadian misalignment in offshore workers, KM Human Factors has designed a solution that exposes workers to blue light during their shift and limits their exposure to blue light prior to sleep. During their shifts, workers can turn on a special light designed to trigger the production of hormones that keep them alert. “When you’re exposed to daylight, your brain will produce serotonin, which makes you feel more happy but also gives you an energy boost, as well,” Mr Meijer said. “At the same time, serotonin is a building block of melatonin, so that’s a positive effect.” After their shift, when the sun has come out, workers can use glasses designed to block blue light before going to bed. When KM Human Factors Engineering introduced this solution on an FPSO, 76 shift workers were trained and supplied with the sleep-enhancing tools. The number of self-reported poor sleepers declined by 50% after the solutions were implemented, Mr Meijer said. In another project, on a heavy-lifting vessel, the number of poor sleepers was reduced from 31% to 7%. If the oil and gas industry can reduce the number of workers who start their shifts tired, it will result in improved performance, higher safety levels and increased health and well being among personnel, Mr Meijer said.